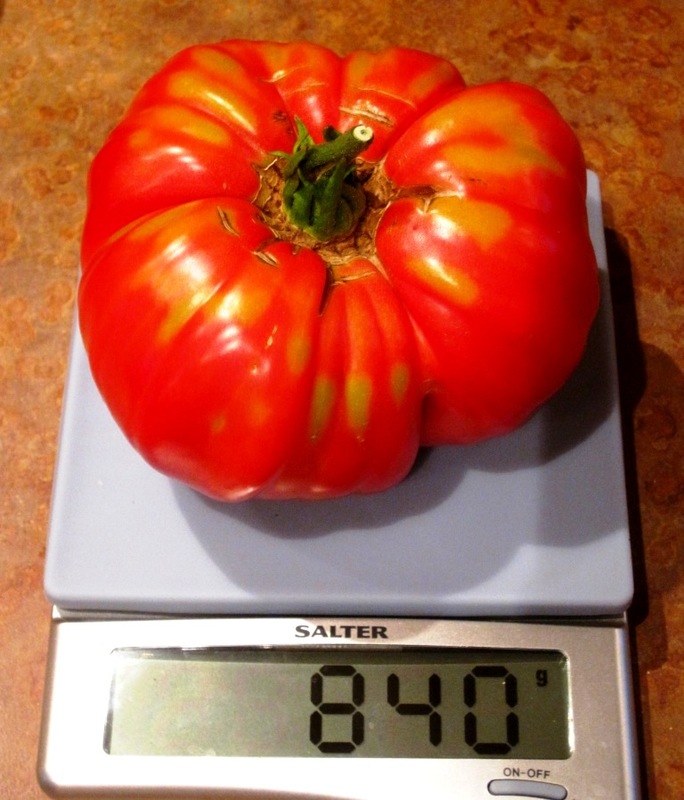 Generally I’m not into supersizing, but this Brandywine tomato, an heirloom variety, is an exception. 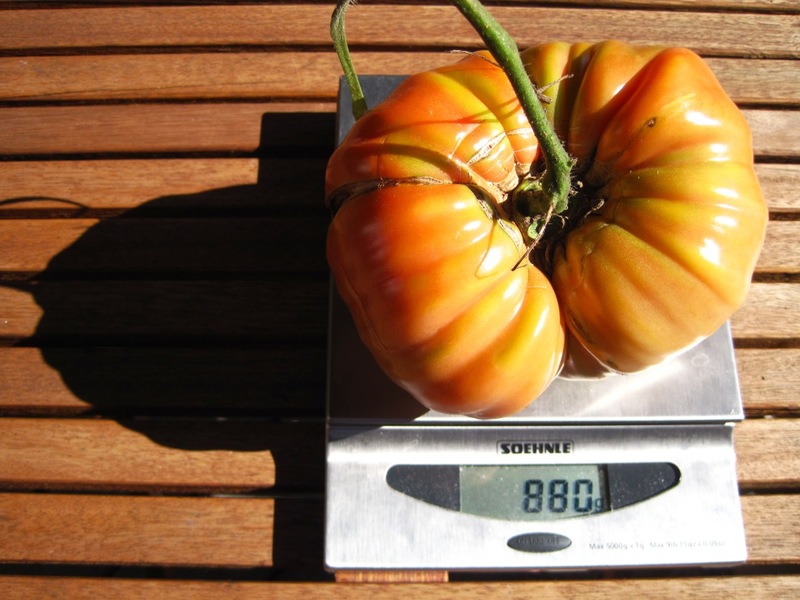 The seed packet promises fruit up to 700 grams, so I grew a whopper at 840 grams! One slice of tomato from the middle of the fruit seasoned with a bit of salt and pepper and touched with some mayonnaise made a great sandwich: flavourful, juicy, meaty. 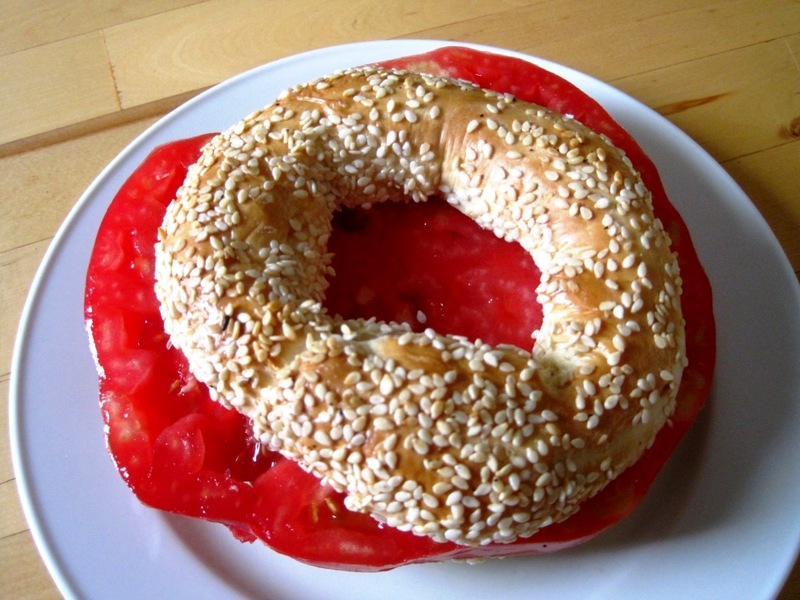 "Tomato steak sandwich" made with a supersize Brandywine tomato. These tomatoes mature slowly (last year, they never ripened), so hopefully we’ll get several more before the end of the season. 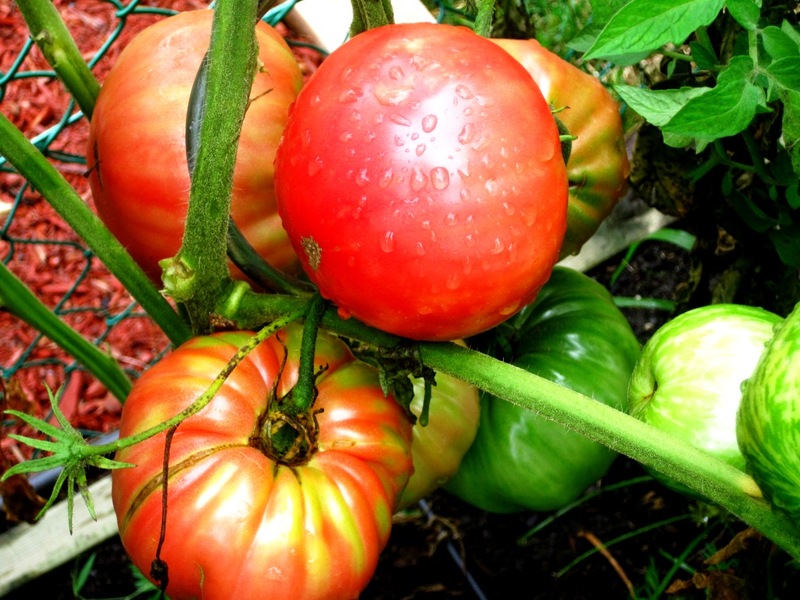 It's amazing how the vine supports the weight of these supersize tomatoes. 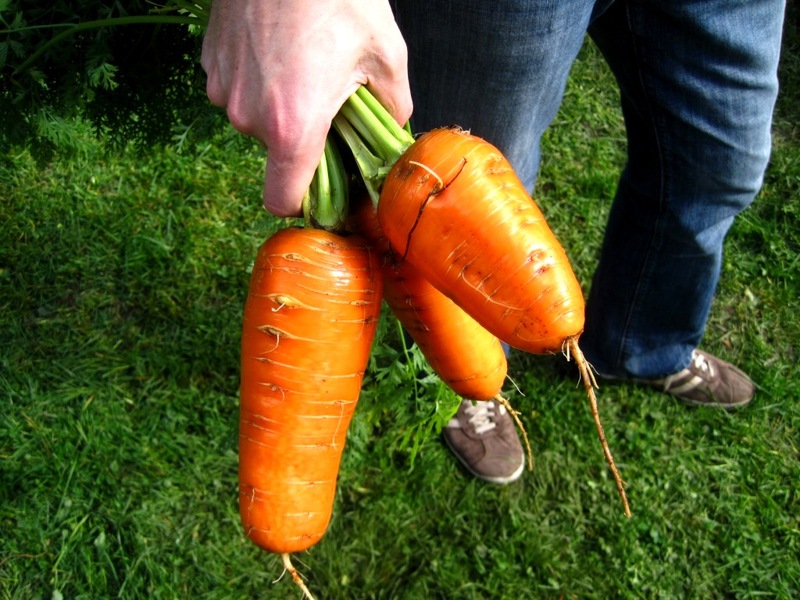 It’s the time of year when fresh produce is plentiful. My vegetable garden (and the farmers’ market) is a riot of bright colours and peak flavours. It’s also the time of year we stuff our freezer with all this goodness, so we can benefit from it year-round. Some of it “unprocessed” and some of it “processed” into ready meals. This year though we have an extra incentive to have prepared meals at our fingertips. In as early as a couple of days, at the latest within a couple of weeks, we will be three! In anticipation of the busy and sleepless time ahead, we have been busy cooking and baking. I’ve been balancing the heat outside with the heat of the kitchen, and have pulled chocolate zucchini cakes, banana breads, oatmeal-chocolate-walnut-cranberry cookies and sunflower butter cookies out of the oven. Meanwhile, David has been the master of the main meals, making turkey pot pies, lasagna, beef and tomatillo stew, sausages, lentil chili. Lentil chili is something we make every year at this time. 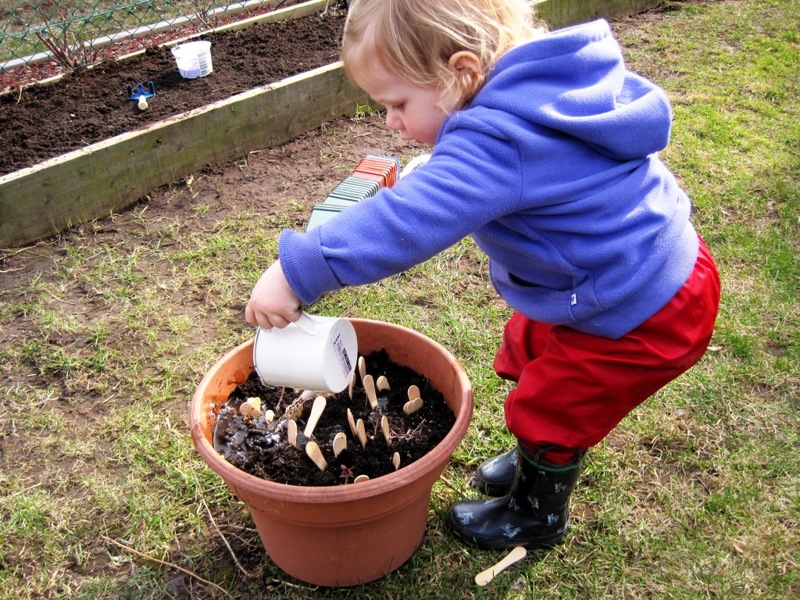 It’s the perfect way to use the many zucchini, tomatoes, peppers and herbs growing fast and furious in the garden, and makes a colourful and healthy meal. 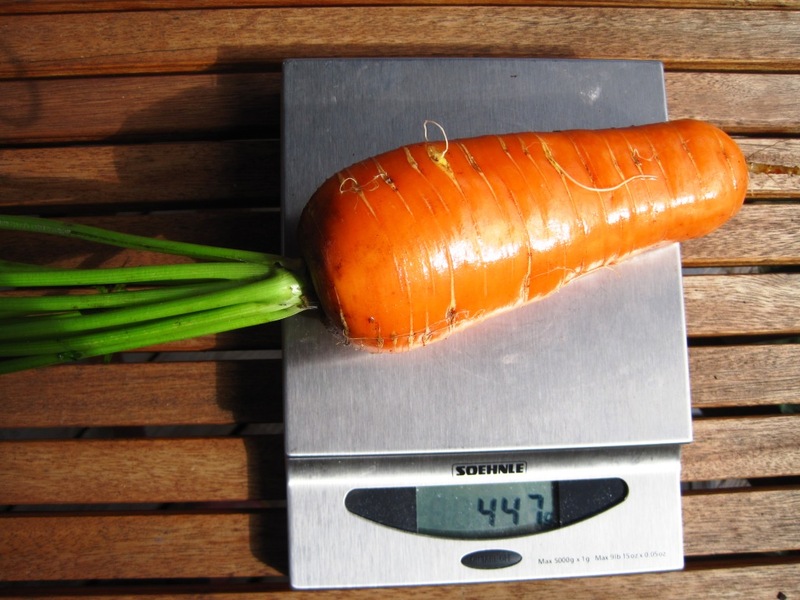 The vegetable measurements need not be precise. 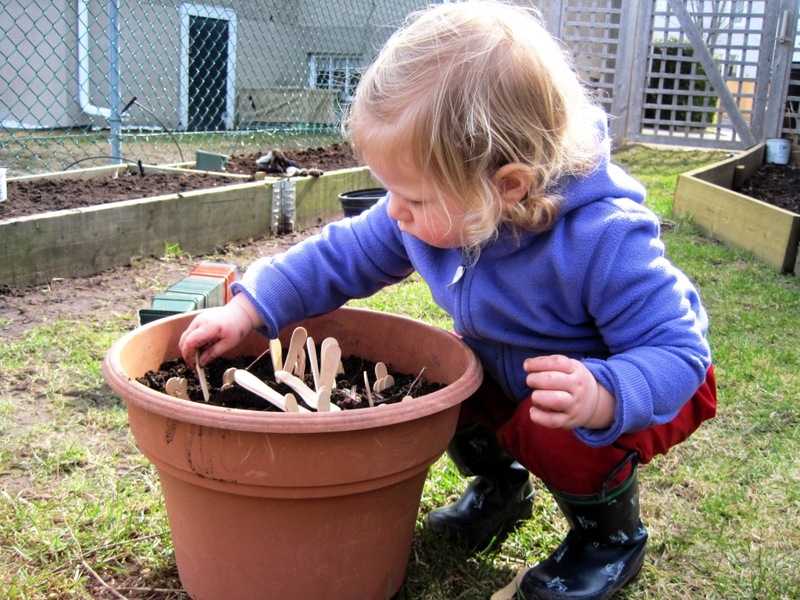 A little more or a little less garden goodness won’t make a big difference! Heat vegetable oil in a large pot. Sauté onions, garlic and carrot until tender. Stir bay leaf, chili powder, cumin and coriander into onion mixture. Add lentils and vegetable stock. Bring to a simmer and cook for 20-30 minutes or until lentils are tender and liquid is reduced by half. Mix in tomatoes, zucchini, peppers, corn kernels and hot pepper. Cook 10-20 minutes. Remove bay leaf and hot pepper. Stir in herbs. Season to taste. 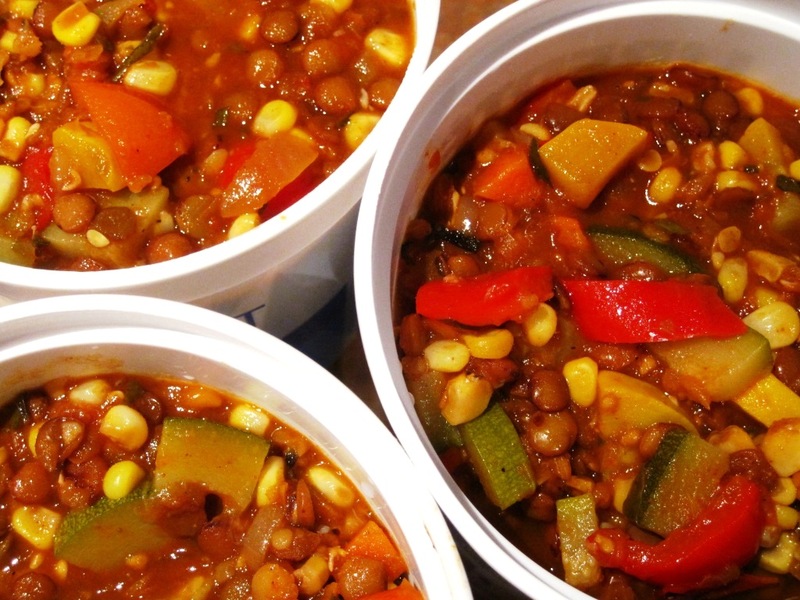 We freeze our summer lentil chili in 1L yoghurt containers and get approx. 4 containers per recipe. Unfortunately I don’t think the tomato (Brandywine variety) will ripen, but the carrot was crisp and sweet. I’m looking forward to pursuing the harvest. This summer’s food discovery was without a doubt smoked tomatoes. My first taste of this flavour sensation was at Town where smoked tomato butter topped corn in a bag. Not long after that, we had smoked tomatoes in a dish at Murray Street. That evening at Murray Street, David and I were seated on its fabulous patio. On the way out, we spoke briefly with Chef Steve Mitton at the kitchen pass. He asked us how our meal was. “Delicious!” as usual. Then David asked how he smokes tomatoes. “Slit them and smoke them,” he answered. “We do them in a stove-top smoker.” Not much to go by, but enough to give it a try! Use perfectly ripe, but still firm plum tomatoes. They will stay whole throughout the process. Mark the tops (opposite of the stem end) with an X and place them stem end down in a dish. I would suggest using an aluminum dish to avoid ruining a dish of better quality—we now have a dedicated smoking dish. Smoke the tomatoes for 1-1.5 hours over indirect heat. David smoked them over apple wood on a Weber charcoal grill. 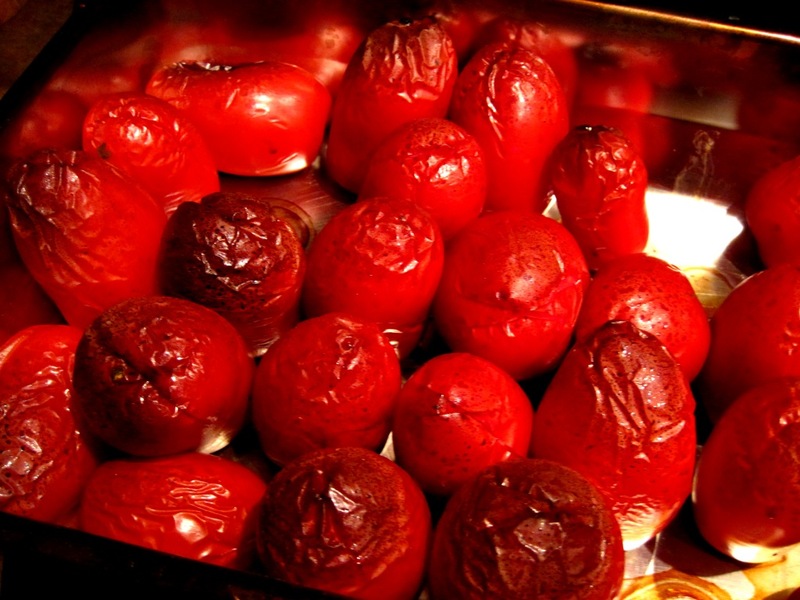 Relatively easy to do, smoked tomatoes add interesting flavour and complexity to dishes. Back in the kitchen, the tomatoes were easy to peel once cool. Aside from freezing some—I think they would can well too—I used them in beef chili and paella. But their subtle and unique smokiness came through best, was truly showcased, in this smoked tomato gazpacho. Start this recipe 24 hours before serving. The ingredients need to marinate, then the flavours need to meld. Serves 6. Combine all ingredients in a bowl and let marinate overnight. The vegetables will draw water as they marinate and create the liquid required for the soup. The next day (8-12 hours before serving), blend the marinated ingredients until smooth. Pass the mixture through a chinois or mesh strainer to remove the tomato seeds. Add some water or vegetable bouillon if the mixture is too thick for your liking. Adjust seasoning. Return to refrigerator. Remove from refrigerator 30 minutes prior to serving. Garnish with basil leaves, finely chopped red pepper or something else that is tasty and pretty to serve. 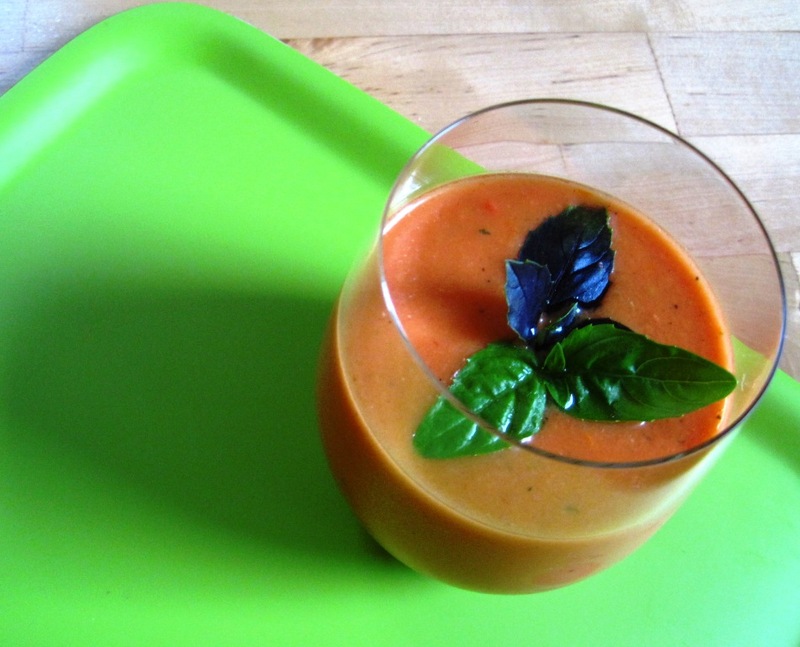 This smoked tomato gazpacho was part of a delicious end-of-summer dinner that included smoked shrimp, velvety paella and creamy caramel flans. 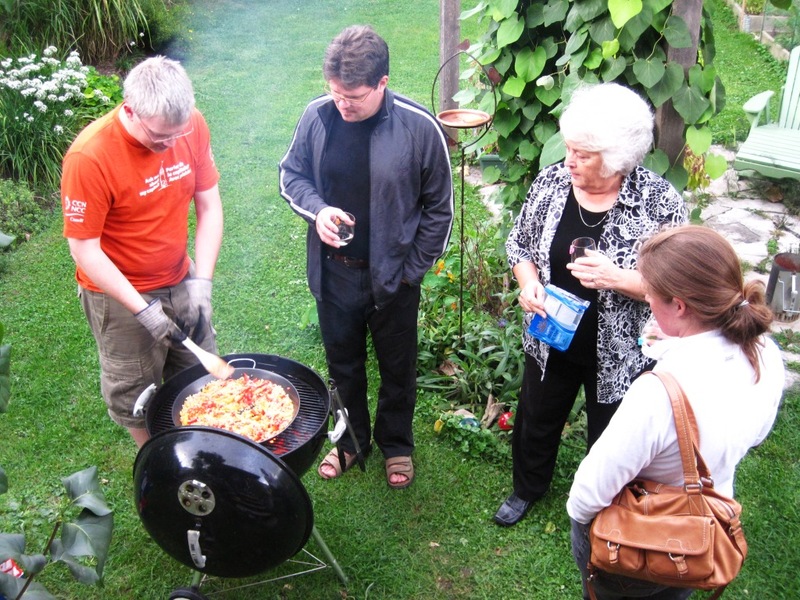 Family watches David cooks paella on the grill. 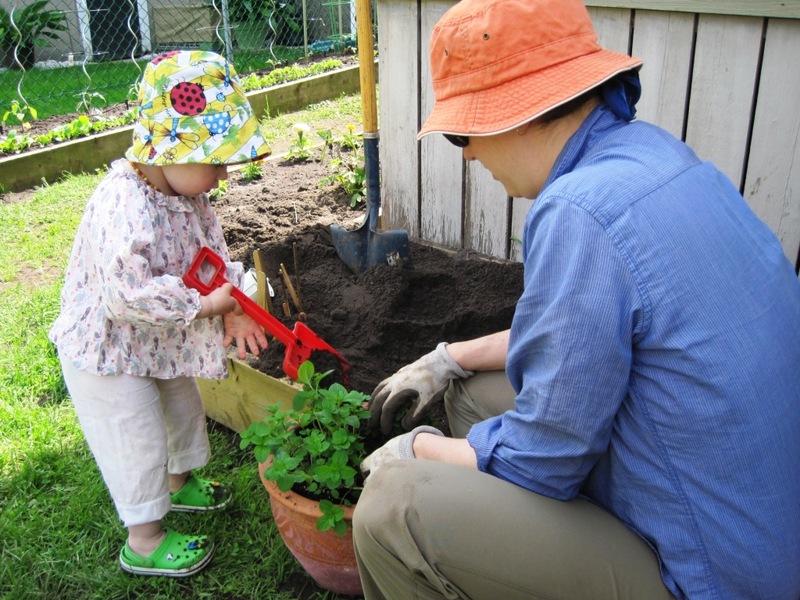 Lately I’ve neglected to write about how my garden is doing, because I’ve been blogging about my side trips instead. It’s also because “lazy gardener” is a pretty accurate label these days. 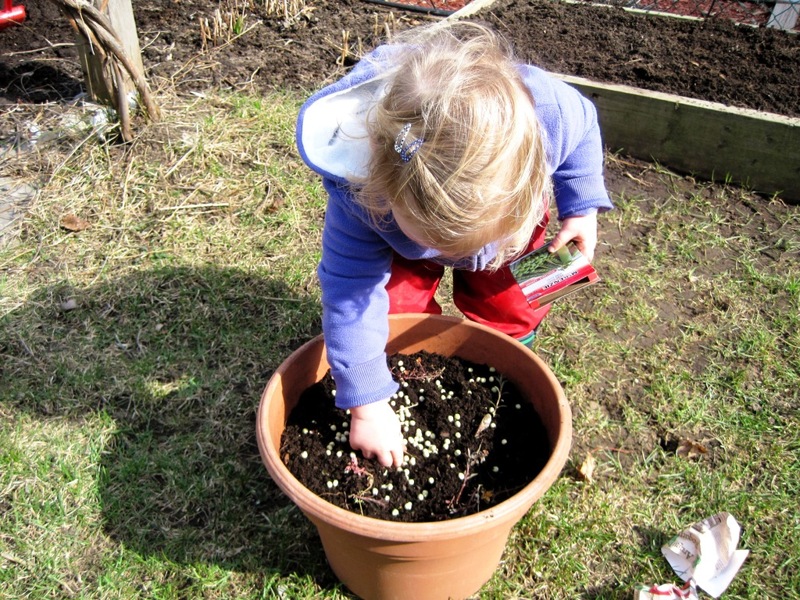 I’m turning a blind eye to the weeds that have crept between the rows of carrots, beets, chard, kale, etc. Instead, I’m like a raven attracted to shiny objects, aiming single-mindedly for the bright orange and red tomatoes, the rainbow chard stalks, and the deep green beans. 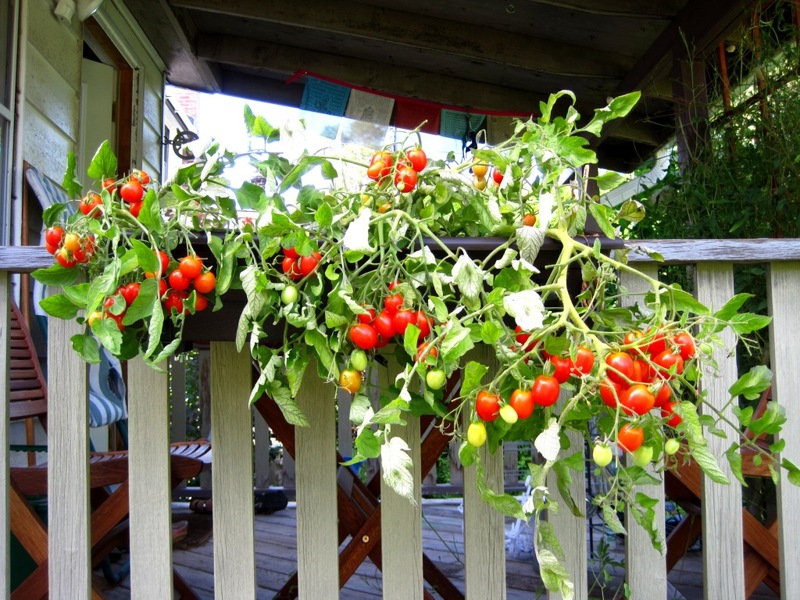 These Tumbling Tom cherry tomatoes worked well in this box and produced a generous harvest. 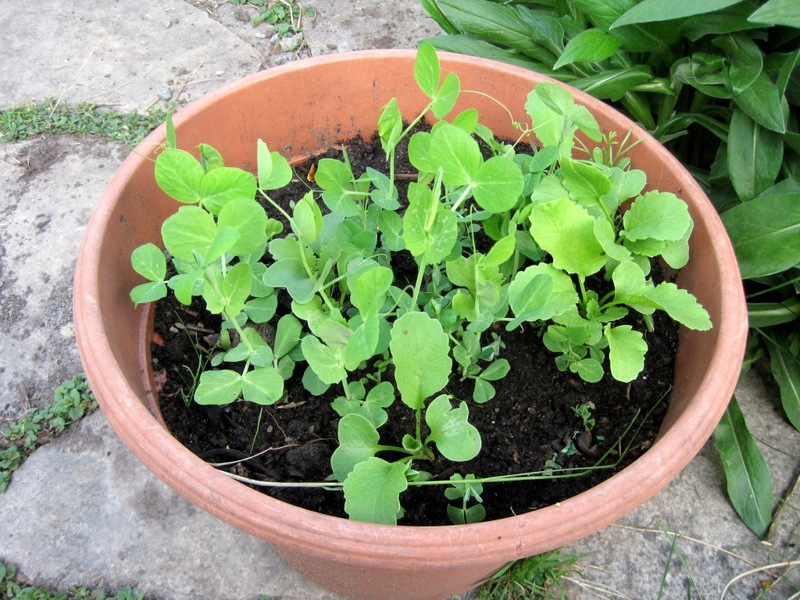 I did manage to plant two kinds of kale after I took out the garlic and the peas. But I’d also planned to do a second planting of peas for the fall. 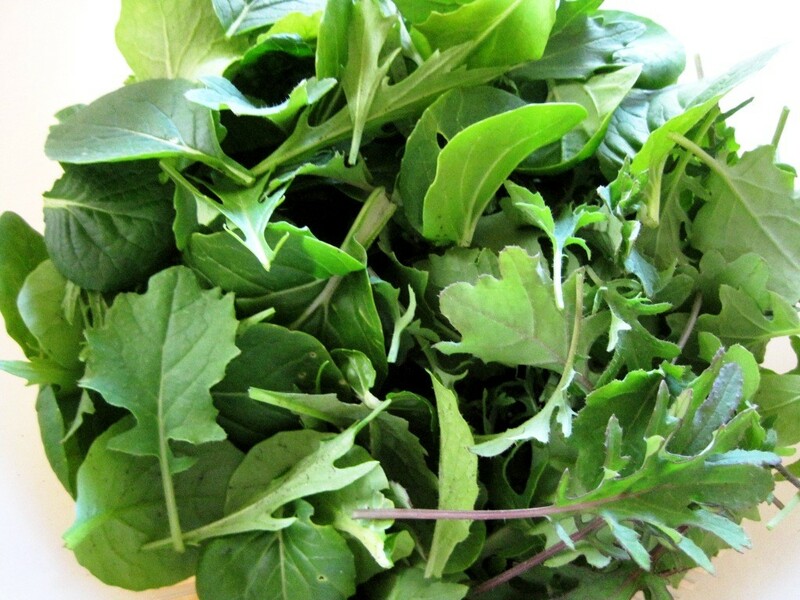 And what about those mâche/lamb’s lettuce seeds, also intended for a fall harvest? Oops… Maybe I should actually pencil it into my calendar for next year. I can live with these oversights, as long as I don’t forget to plant the garlic in October. 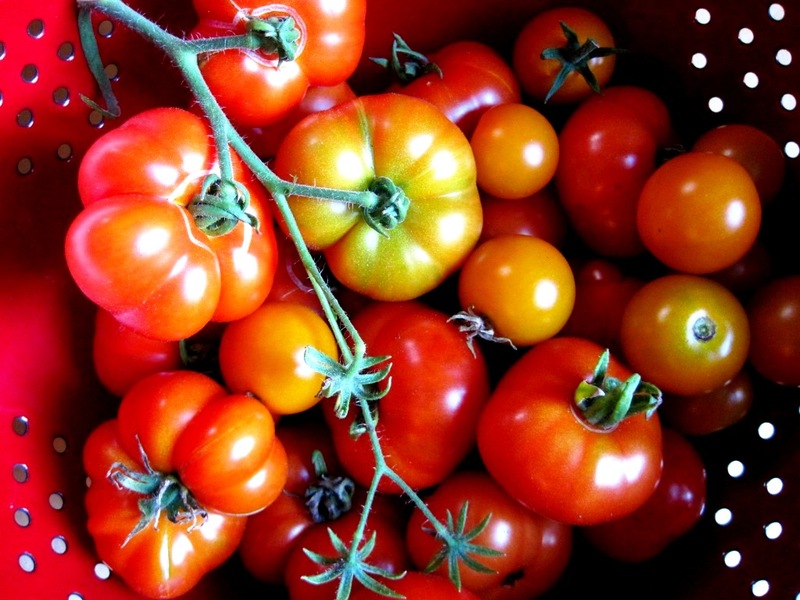 Do five tomatoes a day keep the doctor away?! Trying to keep up with the harvest is another reason I’ve spent less time in the garden—I’m keeping busy in the kitchen. It’s a challenge. Some weekends, it seems like David and I are both cooking/preserving non-stop. And then we made the amateur mistake of not having the patience to wait until our own harvest was ready (or not believing that it would produce enough) and actually bought vegetables at the market to put up… Lesson learned. 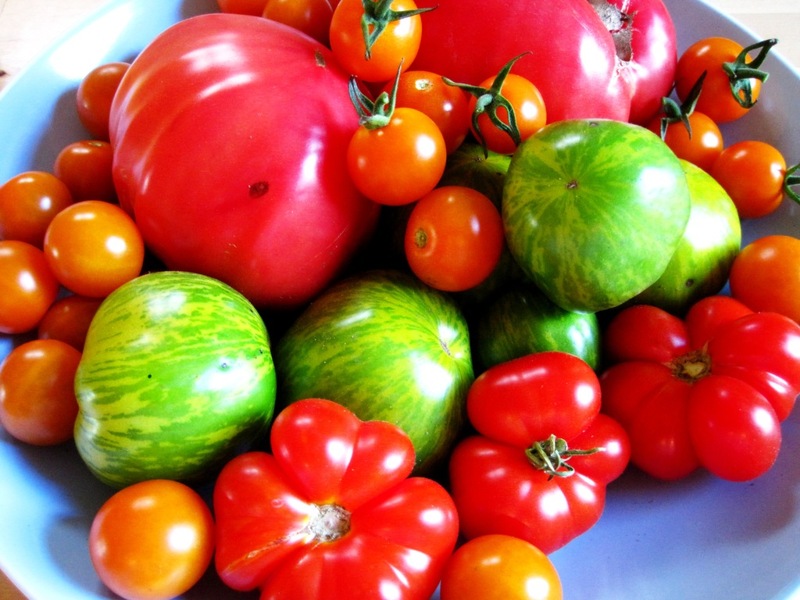 Rainbow of garden, mostly heirloom, tomatoes: orange cherry tomatoes (aka "garden candy"), large red Brandywine (tomato giants), Green Zebra (green when ripe, low acidity) and medium ruffled Calabash (early ripening, touch of sweetness). Can’t complain though. The freezer and the pantry shelves are full of summer’s bounty; we can look forward to great variety this winter. We made salsa verde with this first harvest of tomatillos. I suspect the next basket will be just as full. 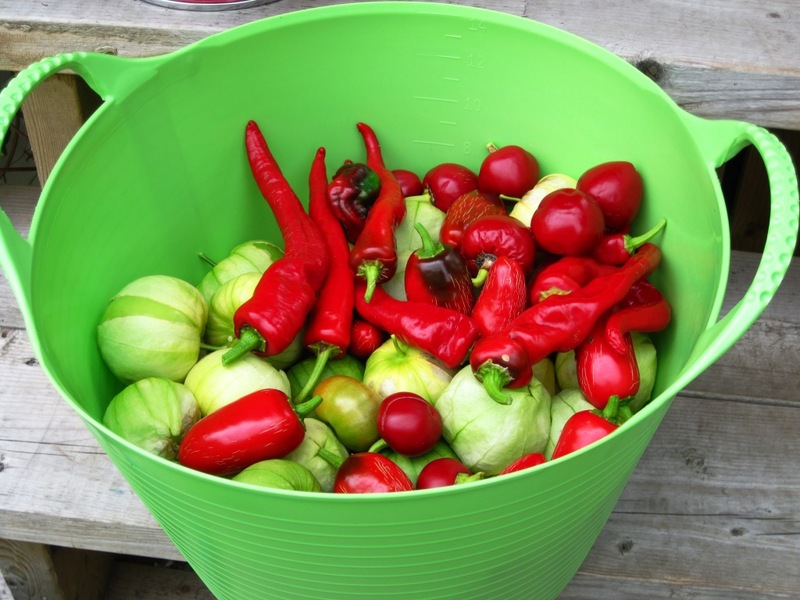 Also a variety of hot peppers: jalapeno, cherry bombs and cayenne. The garden is forgiving too. Everything keeps growing. It’s naturally (and a bit wildly) beautiful. It must know that I love it no matter what it looks like. The orange cherry tomatoes growing in my garden are like candy. Sweet, so sweet. These vines are great producers too. Spaghetti tossed with roast garden candy. 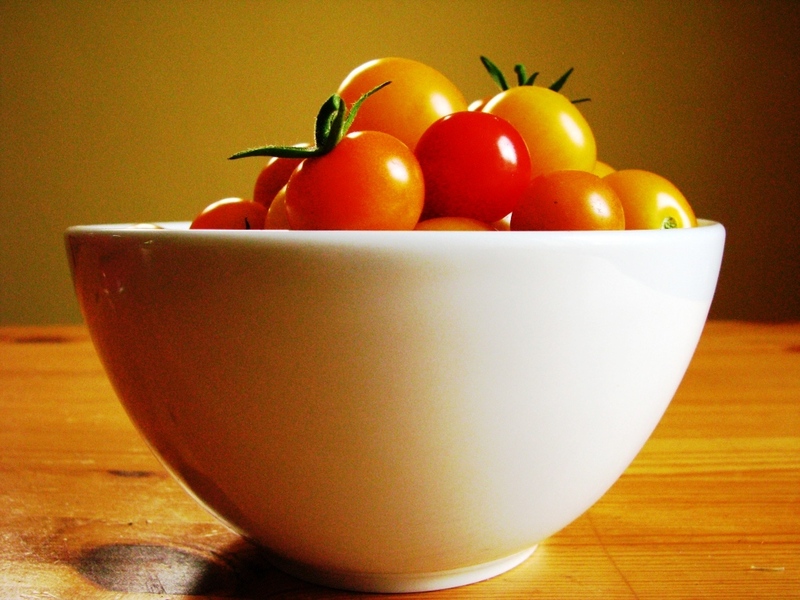 The orange cherry tomatoes are the sweetest, the red ones add nice colour. This time, I also added a clove of homegrown garlic, always a good thing! When I have a bowlful, I like to toss them with olive oil and fresh herbs (in my case rosemary and basil), then roast them in the oven. The heat concentrates their sweetness and they release their juices to create a sauce. 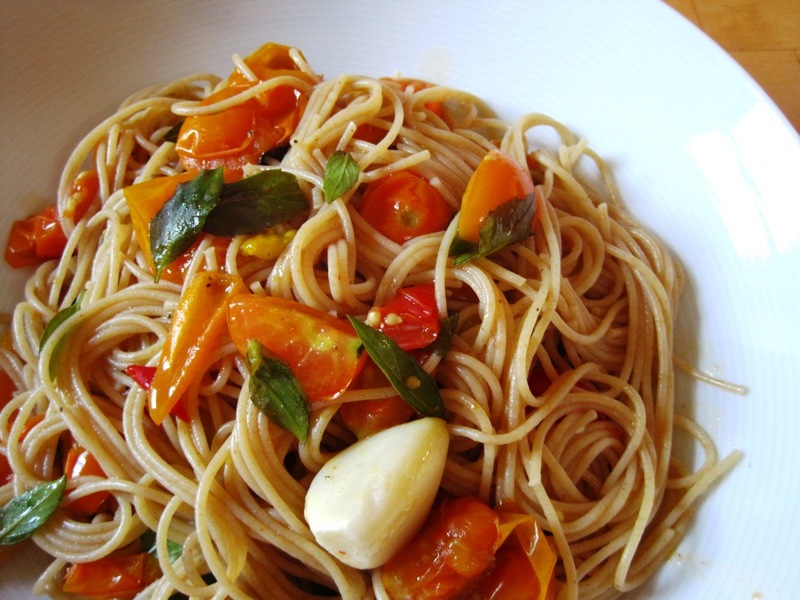 Finally I combine them with pasta, some quartered fresh cherry tomatoes (for contrast) and more fresh herbs (basil). Simple and delicious. Since we're talking tomatoes, here's my first real harvest of Calabash tomatoes, a thin-skinned, flavourful heirloom variety. There are also some orange garden candies mixed in!